In face of the greatest tragedy in history, it is to history that we make appeal. What does it teach us to expect as the issue of the conflict? How far and in what form may we anticipate that the unity of mankind, centring as it must round Europe, will emerge from the trial? 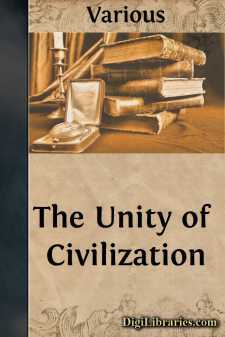 Only two occasions occur to the mind on which, since the break up of the Roman Empire, a schism so serious as the present has threatened the unity of the Western world. The first was the Reformation and the war which it entailed down to the Peace of Westphalia. The second was the struggle against Napoleon, terminated a hundred years ago. The latter was in many respects a closer parallel. It was a struggle of the independent nations of Europe against the overweening ambition and aggression of one Power. It united them in an alliance which achieved its purpose and survived the successful issue of the war for some years. Some such course, with a comity of nations far wider and more enduring than the Holy Alliance as its sequel, we hope and predict for the present war. The struggle at the Reformation was less like the present, either in its causes or its course, but it has some features which make it a useful point for a survey of the permanent unifying elements which hold and will hold the West together in spite of occasional cataclysms and the clash of rival interests and passion. A man like Erasmus, trembling before the catastrophe, willing to make immense sacrifices to avoid an open breach, uncertain of any final readjustment which might restore the harmony of the world, was not unlike some among us who hoped against hope that the enemy might be appeased, who thought that almost any peace was better than any war, who still fear that the breach in unity is vital or irreparable for generations. And the issue three hundred years ago may also inspire us with a cautious optimism, a strong though not unmeasured trust. The right cause triumphed, fully in the end. Freedom was secured, both for churches and for individuals, throughout the world. The evil features in the papal system, against which the attack was really levelled, quietly but completely disappeared, and the institution survived, itself reformed. Before a hundred years were out the world had moved on to the conquest of new vantage points and the establishment of a wider unity on a firmer base. Both previous occasions are therefore full of hope. The European system is, as we shall see throughout these essays, the necessary nucleus of any civilized order embracing the whole world; and the great convulsions which have hitherto continued to occur in it from time to time are moments of especial value for the study of the conditions under which it exists. They are the pathological experiences which reveal the strength and the weaknesses of the normal functions. We strive and hope for a more lasting state of general health, and do not despair of the patient even in this grave attack. He has survived even more serious illness. For though the present war is the most gigantic that the world has ever seen, its very greatness is the result of some of those modern developments—scientific skill, improved communications, national cohesion—on which ultimately the better organization of the whole commonwealth of nations will be built. Passi graviora; we have weathered the storms of the sixteenth and seventeenth centuries, when the old Roman order and its sequel in the Catholic Church were at their weakest and the recuperative power of science and social reform and nationalism had hardly begun its work. We shall not fail with our greater forces of the present to regain and create a Europe freer, stronger, and more united than that which now seems to be shaken to the depths. The process of gaining a greater unity among the leading nations of the world, like all the aspects of human evolution, must be regarded from two points of view, distinct in theory, inextricable in life. What does the nature of man itself demand? How has this nature expressed itself, and been affected in history by the external conditions, the geography, climate, conflict and commingling of races, which the theatre of its appearance has imposed?